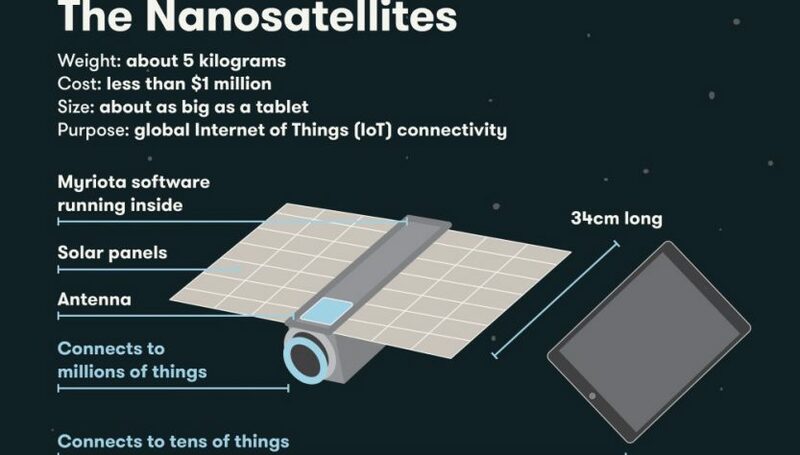 Australian-based Myriota has signed a deal with Terran Orbital subsidiary Tyvak Nano-Satellite Systems for building and launching three Internet of Things (IoT) cubesats. Launch of the first satellite is expected later this year, according to an article in the Australian Financial Review (AFR). Price of the contract value between Myriota and Tyvak wasn’t disclosed. Myriota has four satellites in orbit already, with the new group boosting the number to seven in total with a goal to build a constellation of 50 cubesats. Myriota announced its first official service last week, adding connectivity to Davy Water Products TankSense sensors so a farmer can get water level data directly sent to his cell phone. The service is expected to be commercially available in the second half of the year and is touted as the first mass-market water-level sensor to be connected through Myriota’s low-cost IoT service. Tyvak was selected out of “more than a dozen worldwide providers,” according to the Myriota press release. Part of that selection may have been influenced by Tyvak’s ties previous work in the defense community. Myriota has conducted trials of its services with the Australian military while parent Terran Orbital has landed numerous U.S. defense contracts as well as securing investment money from Lockheed Martin. In March 2018, Myriota raised $15 million in Series A financing, with Boeing’s HorizonX and Singtel’s Innov8 venture funds among several participating in the round. The company was founded in 2015 and expects to conduct another fundraising round in the next year or two, according to AFR. It may conduct an initial public offering (IPO) on the Australian Stock Exchange as one way to raise the funds. Myriota may find it needs to raise funding a bit sooner, however. The low-cost/low-data-size/low-bandwidth segment of the satellite IoT world is being flooded with money and satellites, with Hiber, Swarm Technologies, Astrocast, and next-door neighbor Fleet Space Technologies all building up funds, satellites, and infrastructure in an old-fashioned gold rush/land grab to establish a large presence in the market place and sign up customers as quickly as possible. Fleet Space Technologies announced its Galaxy initiative last week, planning to connect a million LoRAWAN devices around the globe for a jaw-dropping $2 per device per year. While Fleet planned to close applications on February 28, the company’s website says it has already filled up all slots and is now running a waiting list. It isn’t clear how Fleet makes money at $2 per device per year, since it has likely already spent close to $2 million or so to put up its first seven satellites into low earth orbit. The Fleet Portal gateway to connect various devices costs in the range of $2000 dollars and supports LoRa, Bluetooth 4.0, and 802.11ac Wi-Fi, along with communication to Iridium, Inmarsat, and its own satellites. Finally, Astrocast selected European launch startup Orbex to put up to 10 cubesats into orbit by 2023 for its planned 64 satellite constellation. Swiss-based Astrocast has already shuffled around its satellite usage to provide accelerated access to service, with least 20 satellites in orbit by 2020 and an initial distribution of 5 satellites per orbital plane.